I found your website and I love it! My data is being set by a small logging program using NodeMCU. It counts pulses from my energy production meter. I send both the v1 and v2 paarameters. It worked fine, but somehow I see today, it does not add into the Energy Generated (all), which first started about 3pm today. The „average“ also dropped to 0 then. I resetted my “logger”, as I thought it could represent the problem, but it sends the data normally, v1 and v2 accordingly. Do you have any information what could be done to repair it, and what the problems seem to be? Ok, I think my logger may have restarted, and the generation then did not match the values up to 14:55, so nothing has been added thereafter. Do you think there is any chance to make it better? Shall I rewrite the program? when it stop,d at 2.55 pm the the totals for that day do not increase or change from the 2.55 time,so after that this is all you will see	2:55PM	0.311kWh	0.598kWh/kW	figures will not change,it should all be good again tomorrow. How often does a ‘pulse’ occur? Is the variable that holds the count of the pulses ‘large’ enough? I’m not sure what programming language you have used but the different variable types e.g. char, int, long etc have maximum sizes. If your count went too high the value could be interpreted as a negative number or simply overflow. If the counter variable never resets or resets infrequently it is likely to grow to be very large. You can always disable sending energy (v1) and send power (v2) only. PVOutput will calculate the energy. Thank you! This is a great news! I will try to do so and then compare! The problem really seems to be that if - for some reasons - the logger restarts, the energy counter resets and pvoutput is no longer able to add the „new“ counter to what has been added so far. Today 12:15 the average dropped to 0W. And the counter does not anymore, like yesterday. hi again like i said above both average power and power generated must be above zero and if the logger restarts this is not so, perhaps the best thing to do is as BB says above and stop sending energy < v1 > and then if your logger restarts then pv org will just keep adding the new energy output to the day total. Thanks, I will do as BB says - and look for the results, Iwill weite about it here. I am sending the power only by now, bit as you can see on the chart, today 4:40pm the Average dropped to 0W and the Energy doesn’t add any longer. Most inverters require grounding and have protection against ground faults. Is your system grounded to an earth ground? Yes, it is grounded. But why do you ask? The logger is separate, a esp8266 arduino. The inverter is fully ok, and as you see on thr chart, the power sent to PVOutput is good too. My problem is as you see that the average drops to 0 - fully strange for me. I asked because the average power curve looks like a decay process. I see that the power curve is continuous and your system is producing power so the averaging process is being affected adversely by something. How is the average power being calculated? By the inverter or by the datalogger? Do you have an independent means of determining the actual energy being produced? 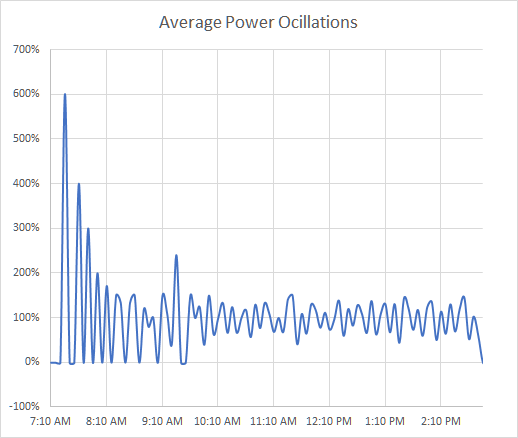 Here is a plot of the oscillations of the average power about the instantaneous power readings for one day 21/3/2019. The inverter doesn’t do anything concerning power logging. This is only done by the new installed arduino and I send only v2 (power generated) by now, not the energy generated. I don’t send any „average power“ - I suppose this is being done by the pvoutput website - is it like this?? I have a SolarEdge inverter for my system. PVOutput gets my data using their API but my average power never varies more than 6 watts either way. That is nothing like the swings you are seeing between -60 to 234 watts differences. PVOutput receives power over 5 minute periods which is reported by my inverter. PVOutput does not compute average power as far as I know…but you should ask @bankstownbloke. The average power for any 5 minute period divided by 12 gives the number of Watt-hours of power for that five minute period. Are you able to provide the code are you using to calculate the Power (v2) value that you are pushing to PVO? Problem: today in the morning at 10:45 the average has dropped to zero again. At 12:55 it went once high, then dropped again. The power generated curve is very nice! I send only this value through the script. Today the same problem - the average drops to 0, then sometimes grows (few times a day), then drops to zero again. Check out this video which describes how you should have set up your system. From the output it appears you may have blown out your inverter. The output is similar to a failing capacitor or other electronic component of the inverter. @iwsmiser : the inverter is working ok!! As you see the power is still there (I send v2), my smart meter is measuring perfectly, and sending out the power data perfectly, too! The only thing NOT working is the „average power“ that is being calculated by pvoutput! So the error seems to be somewhere inside the maths of pvoutput.